This is the first I heard about his passing. But reading the posts in here, I know he was a good man. Wish I had the chance to meet him. Keep the trails in the sky open brother! You've earned your spot in all of our hearts n minds. Aaron was one of my best friends. And I mean that in the very literal sense of both words. Best. Friend. The guy would literally give you the shirt of his back. He could talk trash and had the best ability to let anything roll off his tough skin. It took a little time for it to sink in and in a lot of ways, I still really don't believe he's gone. The first time I met him was at WF09 and he was sitting at a picnic table chowing at the potluck. I sat down next to him with my beer and offered him one. He held up his Mountain Dew and told me "Nah, I'm good." I learned later that he wasn't just referring to his beverage. The dude was good. The MWC has designed stickers to remember Flex. The stickers are a $5 donation for each sticker and the proceeds will go toward a memorial to Aaron Thompson that we hope to have done in the very near future. Please paypal your donation to MWCstore@naxja.org and include your address in the comment box. Please feel free to share this with others who may want to donate. Stickers are approximately 4x7 inches. 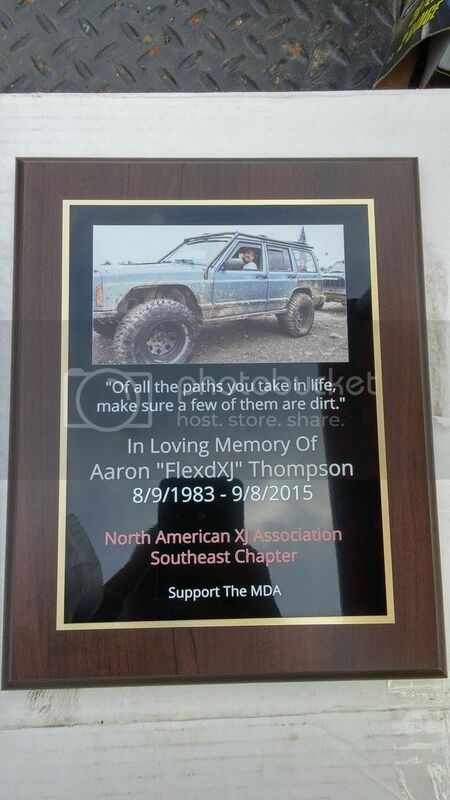 I can publicly release that the memorial that the MWC will be funding at RedBird SRA will be an engraved bench in honor of Aaron Thompson to be placed in the rock crawl area at RedBird. The funds will be paying for the materials and costs involved with building/purchasing the bench. There are still several stickers on hand ready to be shipped for your $5 per sticker donation. Please paypal your donation to MWCstore@naxja.org and include your address in the comment box. Thank you for all the orders so far and thank you to Jacob Schenk (JakeWI) for making the stickers. Dugger, IN - The Midwest chapter (MWC) of the North American XJ Association ( ) recently took part in a clean up run at the Redbird State Riding Area (SRA) in Dugger, IN on November 14th, 2015. The MWC had officially adopted Trail 21 at Redbird SRA since 2008. This year was special, because it was the first clean up run and MWC activity since the passing of long time MWC member Aaron "FlexdXJ" Thompson who passed away in September. The MWC completed several tasks as the park including, with the blessing of the Indiana DNR, taking down a troublesome tree that had caused issues on the trail for several years. Other MWC members assisted in helping DNR workers clean up the entrance to the trail with putting new rock in down. At lunch, members of the MWC joined with "The Main Event" Off road club out of Indiana, to assist with a "Toys for Tots" run that was being held at Redbird SRA that same day. There was also a special presentation as MWC chapter president Matt 'macgyvr' Rowland presented Redbird SRA with a memorial bench and a check for $1000 to Redbird SRA to remember Aaron. The MWC would like to thank Redbird SRA DNR supervisor, Carmen Jackson, Redbird Station, MWC member John 'Lesslimited' Amann for building the bench, and all the MWC chapter members that attended the event. The bench has been mounted. Pics courtesy of Carman Jackson DNR. 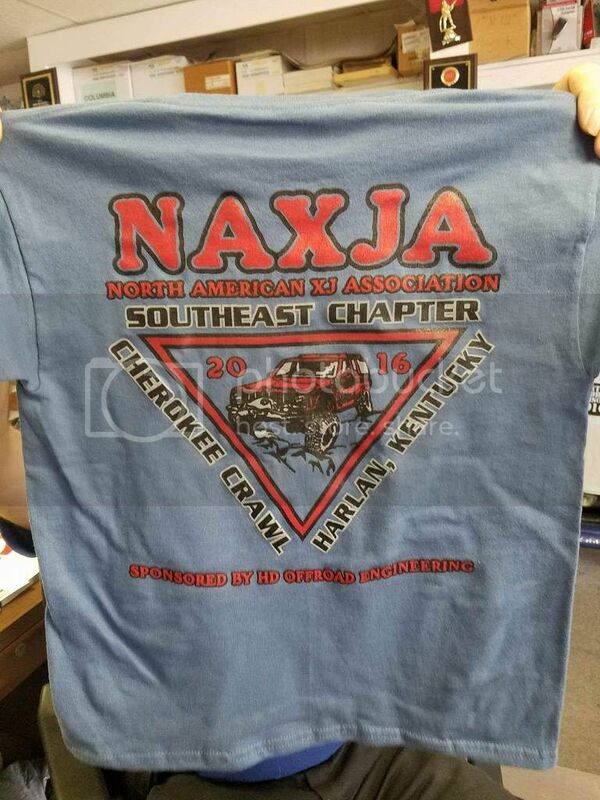 The Midwest Chapter wanted to remember Flex at their premier event, Winterfest, that's held each year in March, at the Badlands Off Road Park in Attica, IN. We had commemorative flags made up to remember Flex. 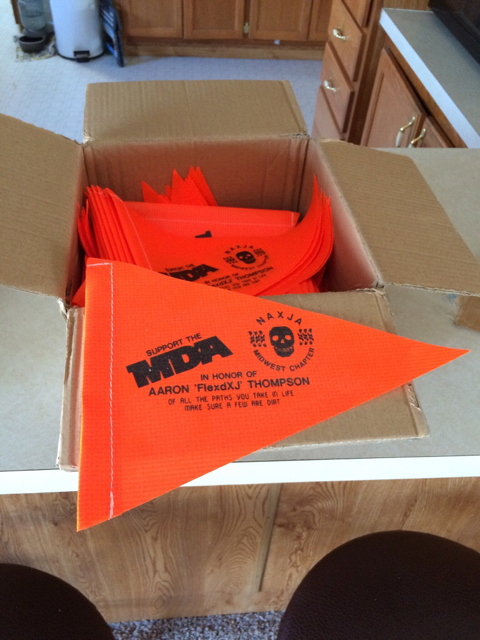 They were given to MWC members with their registration packet. 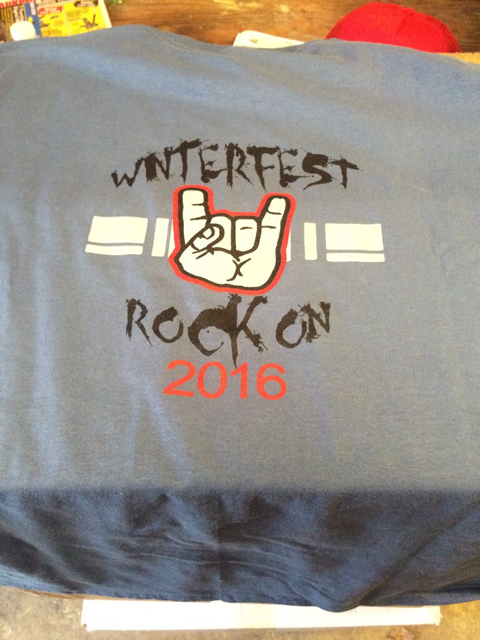 The Winterfest 2016 T-shirt was also a tribute to Flex. From the color of the shirt matching the color of his Jeep, to the hand symbol that means, "Rock On", designed by our residence in house graphics guru, Anthony "Emptypockets86" If you'd ever wheeled with Flex this was his trademark. 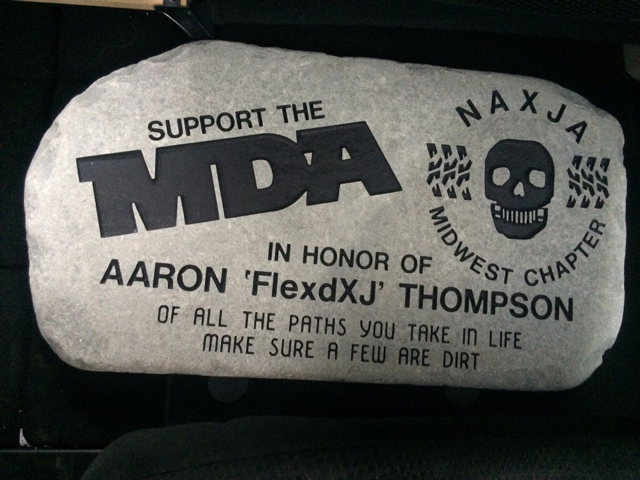 The MWC had a rock made as a tribute to Flex. This rock was left with the Badlands to remember Flex. Lastly, when we were putting registration packets together, we came across and event sticker that was missing part of the grill. For many years when Flex started wheeling with the group he was missing a tooth. We ribbed him a lot about the tooth and he always took it in stride. We left a chair empty this year at the Winterfest banquet to remember Flex. At that empty chair, we put the sticker to remember him. 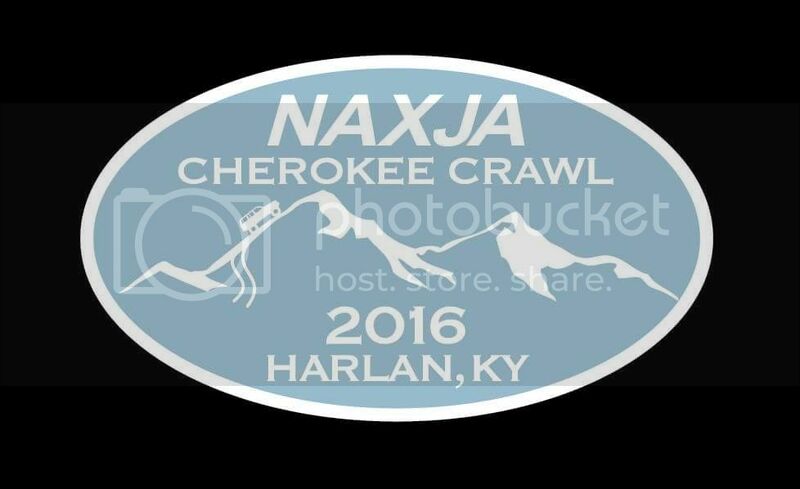 To honor and remember Aaron at this year's Crawl, the SEC designed the event sticker and shirt color to be similar to the gunmetal blue color of his XJ. In addition, the Southeast Chapter designed and purchased this plaque which is now on display in the office at the Harlan County Campground for all to see. The plaque was presented during the Saturday evening activities at the Crawl. All times are GMT -7. The time now is 06:37.